Many of our patients ask about diabetic socks and if these socks are appropriate to wear for their feet. Given that diabetic socks are much more expensive than regular socks, this is a valid question, and deserves a good answer. 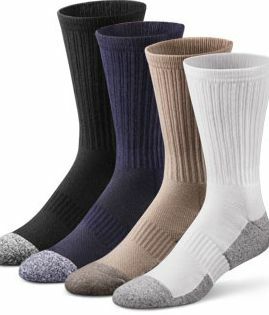 Diabetic socks are typically made from a combination of cotton, nylon, and acrylic. The socks provide increased padding to the bottom of the feet and help to wick away moisture to provide warmth to the foot. In most cases diabetic socks are not as tight around the calf as traditional socks, and this helps prevent pain and constriction when the calf tissue swells. While prevention of sock-related skin constriction is important, unless one has a very swollen leg that fluctuates greatly during the day, this feature is not always necessary. In fact, while diabetic socks can be helpful to some people, many podiatrist feel that a thicker cotton or wool sock will provide the needed cushion and comfort, and may be just fine for diabetic feet. The biggest issue diabetics face in regards to wearing socks is simply the need to keep the feet protected from moisture and friction. These two elements create skin sores, and in diabetics this must be prevented above all else. The socks should wick away moisture (and be changed several times a day in the case of someone who perspires a lot), and should fit well to prevent sliding of the sock material along the skin. Many socks can perform these functions, and an expensive diabetic sock may not be necessary. The best way to know if you or your loved ones would benefit from diabetic socks is to have a full diabetic foot assessment by one of our caring podiatrists. They can evaluate for general foot risks, and come up with a comprehensive way to keep the feet healthy, which may or may not include items like diabetic socks, or diabetic shoes and inserts. On vacation I started noticing that my heels hurt and thought my feet are tired. Nope, Plantar Fasciitis was my diagnosis. My doctor told me to get shoes with an arch and I found diabetic socks shoes and now my feet won't let me wear anything else. I'm on my second pair of these Chicane shoes and I love these shoes because they are very comfortable.